This Safavieh Courtyard area rug is sure to make a statement in any room of your modern home. Made from plush synthetic material, this indoor/outdoor rug is high quality and extremely fashionable. This product is machine-made, which assures quality. The geometric pattern on this beige tan rug is very modern and stylish. This Safavieh Courtyard area rug is a great high-quality option for livening up your home. Decorate the right way with this indoor/outdoor piece constructed from plush synthetic material. This machine-made rug is durable and modern. This orange rug has a stylish geometric pattern for your modern dicor needs. Courtyard Gloria Beige / Dark Beige 8 ft. x 11 ft. Indoor/Outdoor Area Rug This Safavieh Courtyard area rug is sure to make a statement in any room of your modern home. Made from plush synthetic material, this indoor/outdoor rug is high quality and extremely fashionable. This product is machine-made, which assures quality. The geometric pattern on this beige tan rug is very modern and stylish. 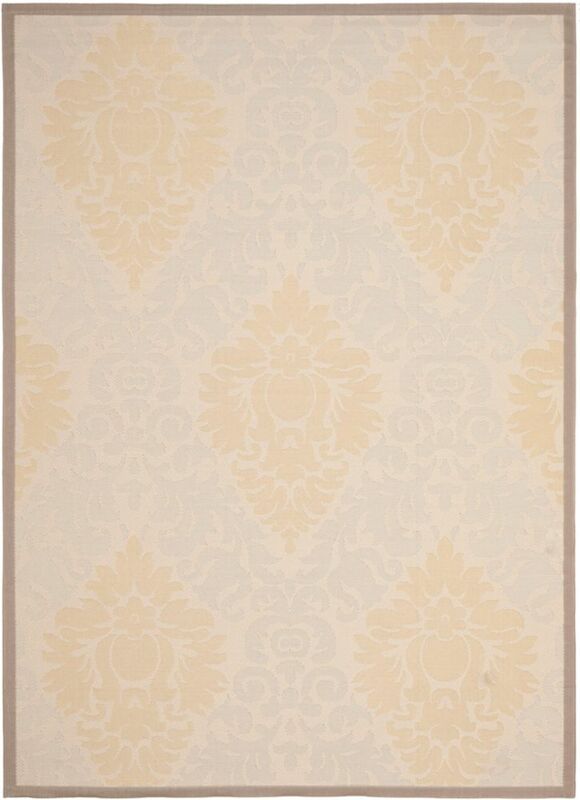 Courtyard Gloria Beige / Dark Beige 8 ft. x 11 ft. Indoor/Outdoor Area Rug is rated 4.0 out of 5 by 4. Rated 2 out of 5 by Jonesie from Not what I thought I wouldn't call this a carpet - it is more of a mat. The fibers are woven together instead of having any kind of plush. Also, the color in the photo is misleading. I checked on several different monitors before picking this and thought it was beige, edging toward peach hues. Instead it was two different shades of grey/beige. This just wouldn't work for what I needed.